All Badge Ebooks Now 99 Cents!!! The End of the Year of the Badge just keeps rolling as I slash prices on my third novel Badge in every format. Now it's ebooks' turn. 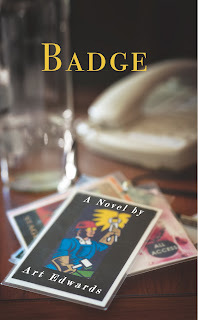 You can now get Badge for a lousy 99 cents for your Kindle, Nook, or for whatever ebook device suits your fancy. End of the Year of The Badge!!! As we reach the end of the Year of the Badge, I want to thank you once again for your support. It's because of you I was able to publish and promote Badge at the level I felt it deserved, and I'm eternally grateful. Now to say thank you in the way anyone can appreciate: I'm lowering the cost of Badge to $5 for the holiday season! If you haven't bought your copy yet, now's the time. If you have, maybe there's someone on your gift-giving list who would dig it. Here's your chance to get Badge cheaper than at Amazon. Also, I have some editorial time open in January and February of next year. Do you need help with your novel, memoir, or nonfiction work? I'd be happy to discuss the possibility of working on it with you. If you can get the words down, I can help you make the words better, and you'll get my special mailing list editorial rate as well. 2014 is Badge's time. 2015 could be your book's time. Finally, I have short fiction and humor pieces forthcoming in Foundling Review, The Farallon Review, and Uno Kudo. Like, before the end of the year. Follow my blog or Facebook page, and you'll be linked as soon as those links surface. That's right. Badge is now a lousy $5 at my website. That blows even Amazon out of the water. And the Badge Four-Pack--which includes all three novels from my rock novel series and my one solo CD--is now a mere $30! Perfect timing for your holiday gift-giving needs. Have to take a victory lap after The Nervous Breakdown published this piece of mine last week about Amazon treating Badge unfairly with ship times, and Amazon changed the ship time! Because of the piece! Read the essay that shook the foundation of a publishing giant!